The main problem of understanding a period like the Middle Ages—560 some odd years after it ended in 1453—is forming a reasonably workable chronology that connects the various stages whereby the Roman Empire became transformed into two branches of Christendom. I begin this third post on the Middle Ages (herewith the first and second) with a map of Europe in 526. It has the merit of marking the 50th year of the Middle Ages, assuming that that period began in 476, the year when Italy when Odoacer, a Germanic prince, deposed the last emperor of the Western Roman Empire and established the Kingdom of Italy. But let’s recall my suggestion that the period could also be dated from the death of Attila in 453. This map also permits us to link back to that time. In the following year, in 454, the Goths defeated the forces of Attila in the Battle of Nedao†—and the East Goths, whom Attila had displaced, once more took over. In that year another great figure saw the light of day, also in what is now Hungarian territory. He was Theodoric the Great. And his life ended 72 years later, in 526, at Ravenna, capital of the Kingdom of the East Goths, shown in red at the center of my map. That kingdom survived him, but not for long. It lasted for another 26 years under seven successors of Theodoric (none of whom had much of a reign), and then reverted back, but only vaguely, to the Byzantine Empire under Justinian the Great. At his death Theodoric (some prefer Theoderic) was not only king of the Ostrogoths, he was also regent of the Kingdom of the West Goths in Spain, and, titularly only, he was acting as the viceroy for the Byzantine Emperor. That sort of arrangement was quite common in those times. At Emperor Zeno’s suggestion, Theodoric moved his tribe, numbering maximally 200,000, to put an end to Odoacer’s Kingdom of Italy; he also executed Odoacer; but Odoacer himself had also been a viceroy of the Byzantine Empire. More interestingly, perhaps, for those of us who imagine that labels like “barbarian” should be understood literally, Theodoric spent his youth (to age 31) in Constantinople as a hostage. He was educated there, indeed held the consulship of the empire for a year. Such “barbarians” as Theodoric might be better pictured as foreign rulers today who’ve had their education in the United States, studied law at Harvard, and speak English like Americans. Now to those “encircling arms.” My map—remember that we’re only at the start of the Middle Ages—shows four large regions of which three are already called kingdoms. The large eastern yellow area was occupied by Germanic and Slavic tribes. 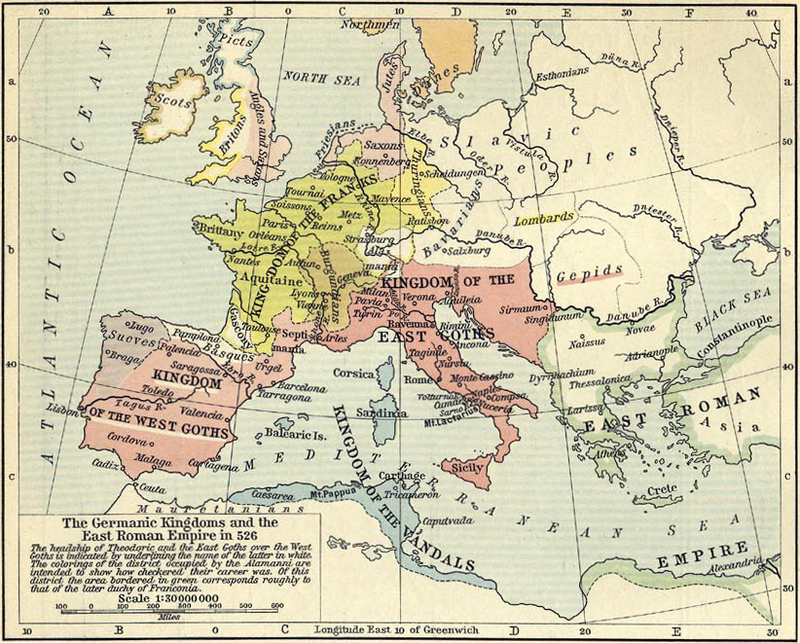 The two large kingdoms to the south are Goths: Visigoths to the west, Ostrogoths to the east. The northern-most is the Kingdom of the Franks. I learned here that, unless you get too picky, that Visi may be understood as Western and Ostro as Eastern; the best way of understanding these directional prefixes is to say that they indicate where the Goths originally came from—the Visigoth from the Western, the Ostrogoth from the Eastern edges of what we now call Scandinavia. The Ostrogoths came upstream on the Vistula river (now in Poland) and eventually spread eastward into Russia, southward into the Balkans, and then turning west again, penetrated Europe from the east. The Visigoth took a western route, passing through what is now France to occupy Spain. This general movement of Germanic peoples—with many, many different names—also pushed others south, east, and west. The Angles and the Saxons occupied much of England and pushed the Celts to Ireland and Scotland; Saxons also hung on to territory in Germany. The name, German, evidently came from the Celts. Celts had long occupied what is now France before being pushed to England—unless you agree with those who say that they occupied England first arriving by water from as far away as Greece. The Franks were one of these “pushed tribes,” if I may use that phrase, pushed south and west, but, later on, the tribal name was applied to others—much as, today, we speak of Hispanics without ever specifying where their genes originated geographically. While occupied with tribal names, the German name for Germans, Deutsche, derives from the Teutons, who originally lived in what is now East Russia and Poland. We pronounce that word as “tootons,” but if we pronounce the eu differently, it sounds more like “toytons,” corresponding with the German pronunciation of “deu.” The largest and most prominent German tribe was the Suebe or Suevi, spread over territories of today’s Poland and Germany. That same word, in German, is Schwaben, a word much used in Poland, to this days, when referring to Germans. A small tribal element of the Suevi (no doubt numbering some 200,000 people or so) also reached as far as today’s Portugal on my 526 AD map. The Bavarians, shown in the yellow region of the map, stayed pretty much where they still are. As for the Lombards, the Bavarians’ eastern neighbors, they were destined eventually to take much of northern Italy when Theodoric’s realm fell apart and the Byzantine reconquest fizzled. In 526 they were still waiting their turn to engage in proper Völkerwanderung. Now if we look at that map and try to predict an ultimate Big Winner, the bet should be on the Franks. They would spread in all available directions and eventually produce the Holy Roman Empire. The Visigothic realm lasted longer than the Ostrogothic. And there is a story behind that that has everything to do with religion. The Franks were Catholic, the Visigoths became converted from Arianism to Catholicism and therefore lasted longer. The Ostrogoths, Arians to the end, have passed into time. Within this European mainland we still have a Saxony, a Swabia (I am showing the region on a modern map of Germany as an inset), but nowhere do we see a Gothia anywhere. Sometimes nothing fails like success. The Arian faith—not to be confused with the Aryan race of which Herr Hitler was so fond—will be our subject in the next post on the Middle Ages. † The battle in what is now the Balkans; it takes its name from the Nedava, a tributary of the Sava river, itself a major tributary to the Danube. The Drina, made famous by literature, The Bridge on the Drina by Ivo Andric, is another Sava tributary. Image sources. 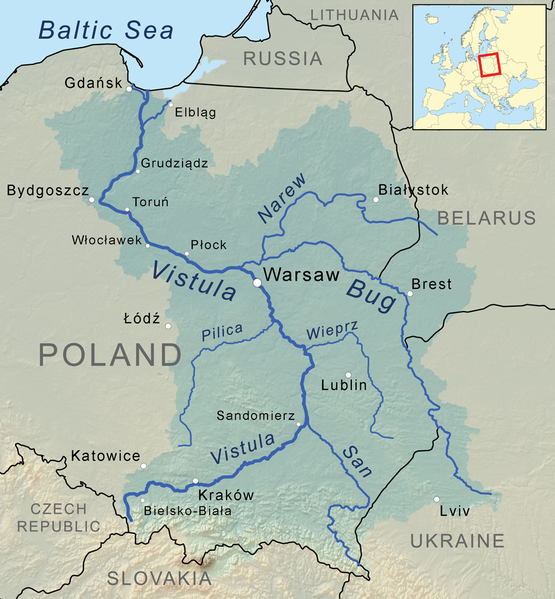 Map of 526 AD: Wikipedia (link); the Vistula river basin: Wikipedia (link); Swabia as part of modern Germany: Wikipedia (link). Suffering from EMFS—But Where is it in the DSM?